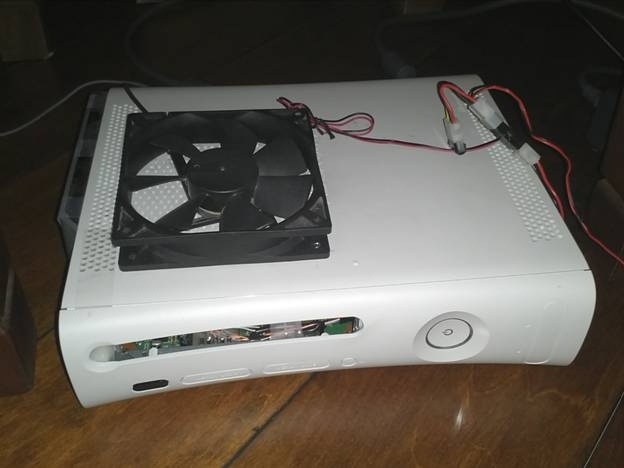 In this project, we will analyze the reasons behind and potential solutions to the widespread hardware failures of the first generation and subsequent releases of the Xbox 360 systems by Microsoft. 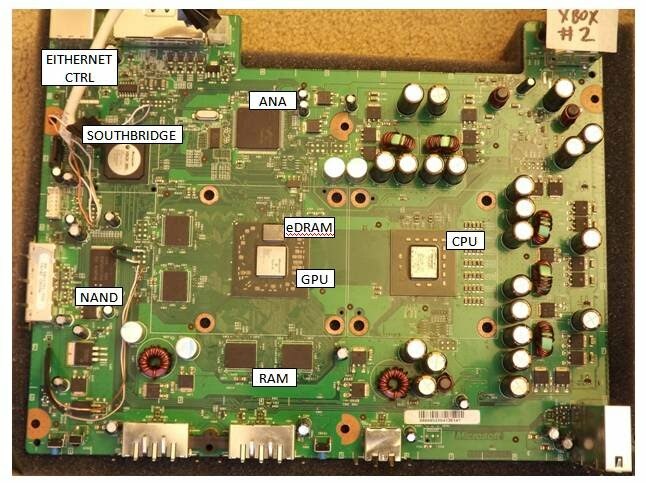 Here is the motherboard of the Xbox 360. This particular board is of the earliest revision, codenamed Xenon. The important components are labeled. The CPU is an IBM PowerPC processor. It is clocked at 3.2 GHz, has three cores, and each core is capable of running two threads simultaneously. The chip was manufactured using 90nm technology, and operating temperature can exceed 70 degrees Celsius, safely. The GPU is an ATI designed chip. It runs at 500 MHz and has 10 MB of eDRAM. It is also manufactured using 90nm technology, and operating temperatures range from 50 to above 70/80 degrees Celsius. The GPUs frequently face problems due to the heat generated. A lot of the components are attached to the motherboard using BGA (ball grid array) technology. 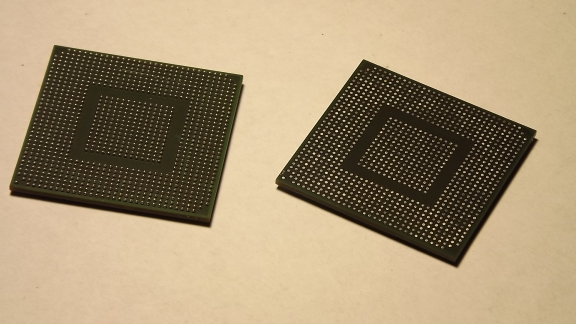 In desktop PCs we see PGAs (pin grid arrays) so that processors, for example, can be replaced, but since this is not necessary on the Xbox 360, BGAs are used. 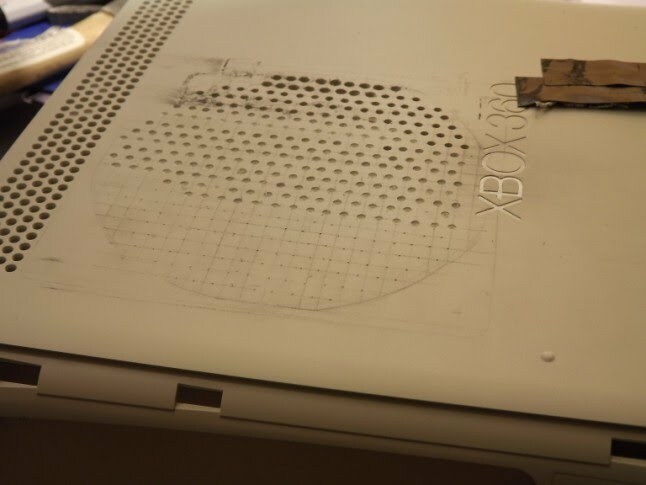 As opposed to the original Xbox, on the Xbox 360 non-leaded solder is used; this kind of solder is more prone to develop faults due to thermal fluctuations and excessive heat, over time. When the system fails, the Xbox 360 displays red lights where there are usually green lights during normal operation. There are secondary error codes which could be accessed, and provide a better diagnostic of what component has failed. In most case however, there is a cold or failed solder joint under the GPU. In rare cases, other BGA packages such as the RAM, Southbridge, or CPU could also develop faults. More rarely, other components may fail. 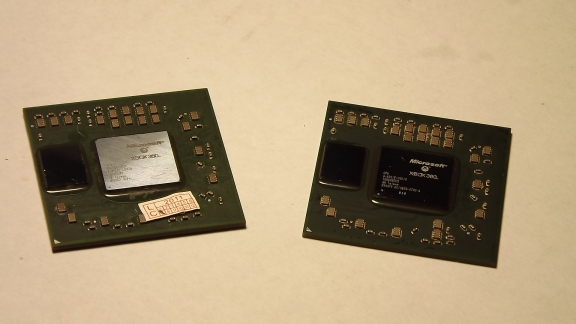 In the case of GPUs, the solder joints that fail are most commonly around the edges. To repair this problem, generally a reflow is performed. During this procedure, the motherboard is heated (as it was during the manufacturing process) particularly in the area where the cold solder joint may be, with flux applied. This melts the solder and causes the metals to bond correctly once again, eliminating the red lights. In some cases it may be necessary to reball the GPU BGA package. During this procedure, enough heat is applied to melt the solder under the GPU and then the chip is lifted off the board using a suction tool on the die. Below I have two GPU chips only. The one on the left has the solder balls reapplied to the bottom while the one on the right does not. Afterwards, the chip would be placed back on the motherboard, and flux and heat would be applied to reconnect the metal contacts. 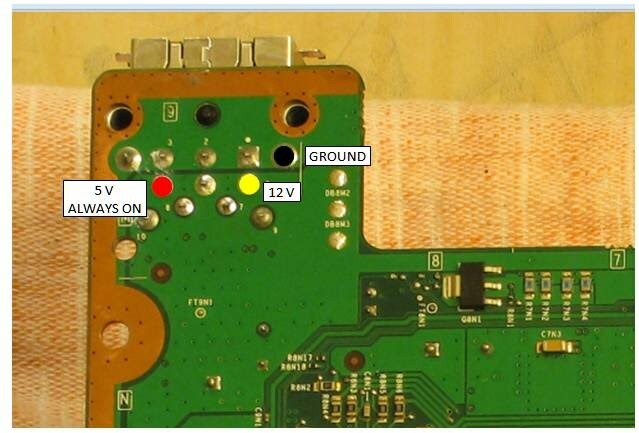 Once the BGA packages have been reattached to the motherboard, additional preventative measures are necessary to ensure that the problem does not arise again. The thermal interface material between the heatsink and the GPU/eDRAM/GPU die could be improved. The original compound used is shown below, a silicon pad attached partially to the heatsink. 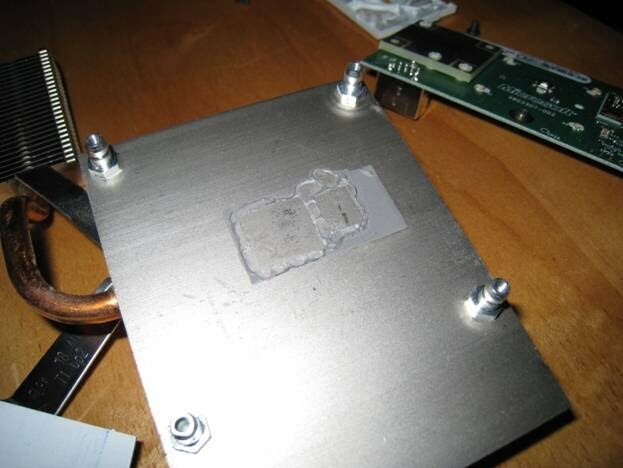 Clean both the heatsink and processor dies using isopropyl alcohol and a lint free cloth until there is a mirror finish as shown below. Apply a high quality thermal interface material such as Arctic Silver 5, to the center of the GPU/eDRAM/CPU die and let the pressure of the heatsink spread the thermal paste to the edges. It is important not to spread out the thermal paste in any other manner because if the heatsink is placed over it, air pockets will form between the surfaces and heat transfer ability will be diminished. Further improvements include the addition of extra fans to improve the airflow of the system. The internal DVD ROM drive could be placed externally, and a high CFM airflow fan could be placed over the GPU heatsink. Below, an 80mm fan is shown as an example. 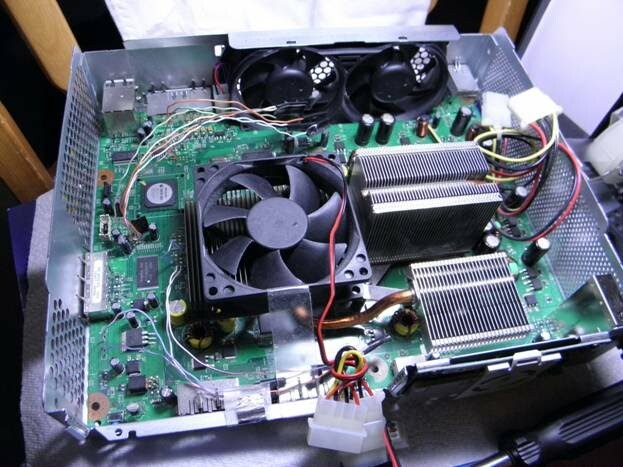 To attach the fan to the heatsink via screws, ensure that the threads grasp onto the fins of the heatsink. An alternative or additional area for a fan is on the external surface of the case. 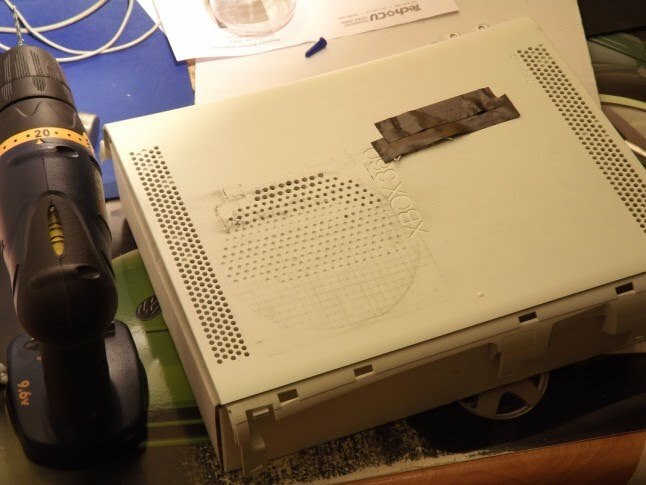 It could either be placed on the left side if the DVD ROM drive is removed, or on the right side to provide direct airflow over the heatsink. This is useful especially if you have the extended GPU heatpipe as shown in the previous picture. In order to do this, print and paste a grid on the surface of the case. Using a sharp nail and hammer, puncture the plastic along the grid as shown in the pictures below. Go over the depressions with a drill, using them as a guide. In this example, a 120mm fan is used. Attach them via two screws at the corners. The completed example is shown below. The rear exhaust fans should run at a higher RPM than specified by the stock System Management Controller (SMC) code. For optimum balance between noise and airflow, run the fans at 70%, with shutoff temperatures around 70/80 degrees Celsius. Alternatively, use a voltage regulator set at around 8.4 volts to power the rear exhaust fans. If ambient temperatures are particularly high, run the fans at 100% through SMC code or hardwire them to the 12 volt power source. Conclusion: The vendor has independently recognized the hardware faults, and has released revisions of the system which have reduced or eliminated problematic units. Revisions include smaller nm technology for the processors, and revised heatsink designs.